The ingenious works of the greatest Russian composers have attracted a record number of listeners. What is the connection between the Academy award-winning “Peter and the Wolf” and “The Black Swan” with its Academy award-winning star Natalie Portman? What is the connection between “Romeo and Juliet” and “Star Trek”? What is the connection between Mel Gibson’s remarkable role in “Braveheart” and “Sheherezade”? And finally, what is the connection between Arnold Schwarzenegger’s classic “Conan the Barbarian” and… “The Flight of the Bumblebee”? Well, they all feature the ingenious works of the greatest Russian composers, such as Rimsky-Korsakov, Tchaikovsky, Rachmaninov, Prokofiev, Stravinsky and Shostakovich, and they can all be heard in Warsaw in one week’s time. Ten of the best ensembles selected from among music schools all over Poland will perform in a week’s time – on 28-30 September on the stages of the Grand Theatre – National Opera in Warsaw, during the international “La Folle Journée – Russia” festival, playing works by the greatest Russian composers, including Rimsky-Korsakov, Tchaikovsky, Rachmaninov, Prokofiev, Stravinsky and Shostakovich. The genius of the greatest Russian composers will be presented over three days by approximately 950 artists from all over the world. How to entice the greatest possible number of young people to listen to classical music? How to convince them that the concert hall is also for them? The answer lies in “Musical Chairs”. 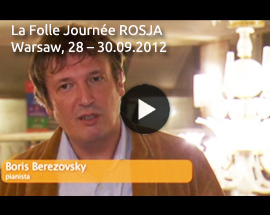 The international “La Folle Journée” festival will take place in Warsaw for the third time, on 28-30 September. During these three days, 950 artists from all over the world will present the musical genius of the greatest Russian composers: Rimsky-Korsakov, Tchaikovsky, Rachmaninov, Prokofiev, Stravinsky and Shostakovich. Tickets are on sale now.